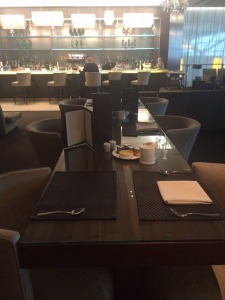 This is my review of The Concorde Room at London Heathrow Terminal 5. 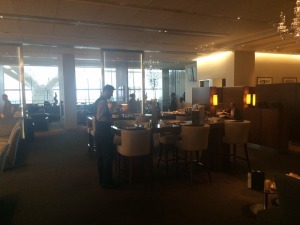 The Concorde Room is the flagship British Airways lounge at Terminal 5 with a sister lounge at JFK in New York. It is only open to passengers holding a First Class flight ticket or who hold a Concorde Room card, given out for earning 5,000 tier points in a year. The name is a carry-over from the days when Concorde was still flying and British Airways was based in Terminal 4. The Concorde Room was the dedicated departure lounge for that service – it was the only BA lounge which allowed you to board the plane directly from the lounge. You enter the Concorde Room through the white door which is found immediately after passing through South Security in Terminal 5. There is no need to take the escalators down into the shopping area and then back up again. According to urban legend, this was a late design change when Terminal 5 was being built and British Airways had to pay a huge financial penalty to the airport owner. I have seen sums as high as £14m quoted in the past, designed to offset the lost commission from Concorde Room visitors no longer passing the shops. 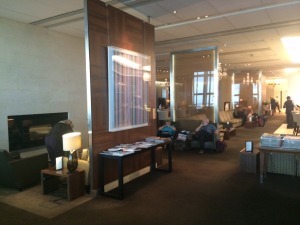 Rather like the Plaza Premium lounge in Terminal 2 which I reviewed recently, The Concorde Room is a little lacking in natural daylight – although some does come in from the large terrace. The dark ‘executive’ colour scheme used for the furnishings does not help. The Elemis spa is situated outside The Concorde Room which is why I did not photograph it. If you are holding a First Class reservation you can now book spa treatments in advance which does mean you have a decent chance of getting a slot. It also means that Club World passengers in Galleries First have almost no chance. Similarly, I did not visit the cabanas, where you can reserve a private room for a rest during a long connection. This is potentially the main selling point of the lounge. As you can see, there is nothing earth shattering about the architecture. 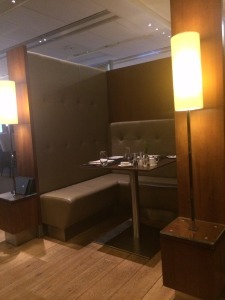 The standout feature is the private booths available for dining. 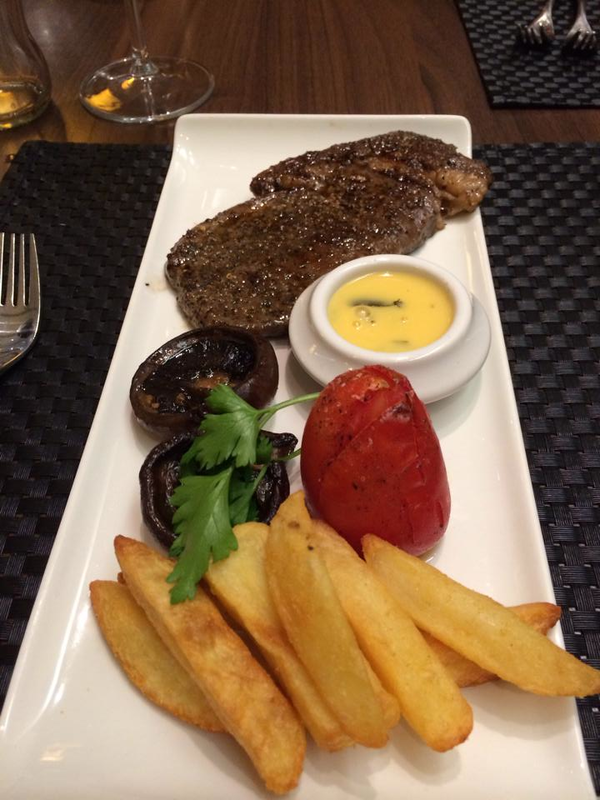 The quality of the food, unfortunately, is not noticeably better than what is served in Galleries First – and presumably they use the same kitchen. If you are expecting the sort of gourmet delights offered by Lufthansa in the First Class Terminal in Frankfurt, for example, you are out of luck. 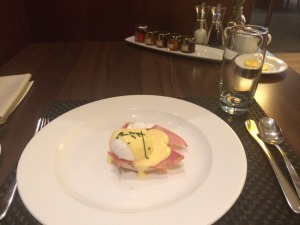 My eggs benedict, above, is looking a little lost. The bar does look impressive. However, unless you want a cocktail, you may prefer the self-pour approach used in Galleries First. There is nothing in The Concorde Room to match the impressive champagne bar in Galleries First. If you need to work, there is a totally separate room with four PCs and two printers. This is an improvement over the open plan work area in Terminal 5 – you do get a proper desk and chair here. All in all, this is a perfectly ‘sound’ lounge. Like much of the British Airways First Class offering, it does the job in a satisfactory way without ever attempting to reach greatness. BA has an official website for the Concorde Room if you want to find out more. PS. The first British Airways screw-up of the day occurred here. When I checked in, I was told that my flight was delayed by 20 minutes. This was repeated to me when I entered The Concorde Room. 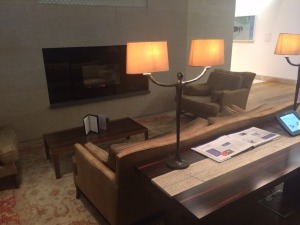 However, at some point between entering the lounge and the flight departing, the 20 minute delay disappeared. At no point did anyone bother to find me and tell me. It was only by coincidence that I realised, very close to the cut-off time, that the flight was no longer delayed. And, as an A380 departure, I then had to get myself over to Terminal 5C in record time …..
redspottedhanky adds booking and postage fees - where should you book now? any idea of what lounge to expect travelling from Kuala lumpur next year in first? 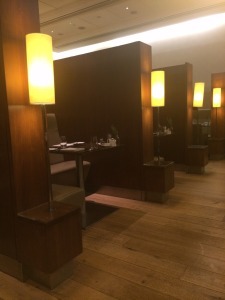 If oneworld and in Business you can use the MAS Golden Lounge (Business Class), there is a separate MAS First Class lounge which doesn’t look too great, you might be better checking out the business class lounge also to see what you prefer. 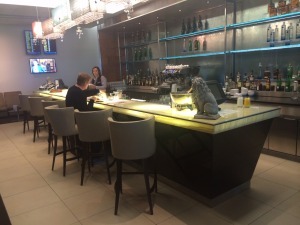 If oneworld, also the option of using the CX Business class lounge, but its small and with basic food. The MAS business class lounge gets some mixed reviews, but I thought it was pretty good (quite spacious and good food offerings) and there are big windows to watch the planes from. There is a bar service (not self service). You should also get some fast track security passes. We will be taking our first flight in F next year and plan to use the spa and CCR. How long would you recommend allowing before the flight for a spa treatment and dinner in the CCR room without having to rush? I normally pitch up at the airport 3 hours before. You should be in the CCR within 15 minutes of entering T5 even if checking a bag and, assuming you head off to board 40 minutes before departure, it gives you 2 hours. Really disappointing to find out that everything I suspected about the annoying need to turn away from the Galleries First lounge after exiting Customs, go about 100 feet in the opposite direction, down an escalator, proceed past a load of gaudy shops for people that don’t know quality from bling, walk another 150 feet, then trail up another escalator to the Galleries First lounge that you were already practically next to when you first exited Customs…. Well, to find out that as I suspected, that complete waste of my time has actually been e n g i n e e r e d, well that just tee’s me off using any UK airport run by BAA in the future anytime I can avoid it. It’s insulting and disrespectful of people’s time. One point of clarification… Any passenger in CW (or F) can access the Elemis Spa – you don’t of course need access to the Galleries First or Concorde Room in order to access it. There is also a Spa in T5B for passengers who know their flights are departing from B or C gates. That tends to have comparatively good availability as any F passengers prebooking will inevitably do so in the main terminal. It doesn’t offer all the treatments though. are these treatments included or chargeable please? My only experience of BA First in Oct 12 was somewhat disappointing. We flew from Toronto to LHR on an elderly 747 in need of some TLC. It was no better than Club except that we were escorted to our seats and given pyjamas etc. The lounge in Toronto was quite small and the dinner there was pretty average, especially compared to some of the places we had eaten in the city. When we go to Canada next autumn we shall stick with Club, although I hope we can go to Vancouver in First in 16 which will be our last long flight due to old age. I just hope that certain companies do not wake up and remove our ways of earning lots of Avios + 2-4-1. I wish they’d fix the charging points in both the Club and First lounges at T5. Most of them dead when I visited the other week. They must spend diddly squat on maintenance…. The BA App is pretty accurate regarding delays. I find it more accurate than what is displayed in the lounge. The Cabanas in the CCR aren’t worth booking. Not much bigger than the showers in the T5 arrivals lounge (ok that’s not quite fair). Feels like you’re in a dentist’s office though. Now the Cabana’s in the CX First Wing lounge in HK. That’s a different story. It’s truly like a personal sanctuary. However, you cannot order food and drink like you can in the Cabana’s in the CCR.. No bother, there’s self-serve champagne just outside the CX cabanas – I help myself to a bottle to take to my Cabana. A tip for those unacquainted with the CX cabanas, the robes are craftily hidden in closets near the door that are easily mistaken as just walls. I have an option for flying back from Mumbai to GLA in BA First, during the LHR stopover would I be entitled to use the Concorde Lounge? Technically it’s a first class ticket.